…it was another photography night in The City. It was about 15 degrees, ice was forming on the street corners where water usually deposit after the rain, clouds of hot steam were coming out of my mouth while I was walking. It was the first, real cold New York night of the year. 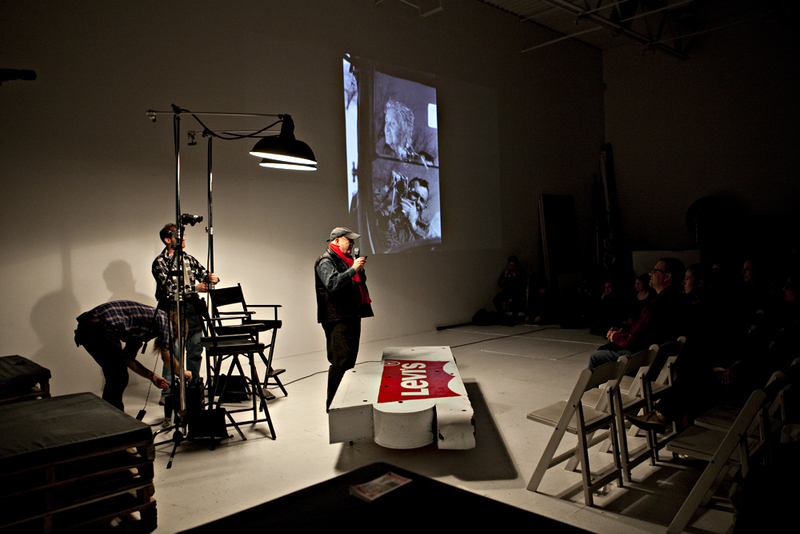 But, Bruce Davidson was going to speak at the Levis Workshop in the West Village and I couldn’t miss it! I had seen Bruce speak in public before, it was in Sept. at the end of the David Alan Harvey loft workshop I attended but there is never enough photography talk especially when the one to speak is a Magnum God. Plus, what Bruce said last night was exactly what I needed to hear before my photography adventure in South America. This is the case of Brooklyn gang and East 100th Street, two of his most prestigious works. I guess, I often think *(read) too much before I gather my camera bag and just get out of the house to shoot when indeed I may already know what I am in love with and what I therefore should be continuing on shooting. But, at times us photographers get fixated in the “climbing-the-ladder-sort-of mind game” where we would do anything to get above average and produce only high quality material. Of course, this is where every talented photographer should aspire to be. But, we forget about the “having fun part,” the “loving what we decided to photograph” and this shows in our final product. Since there are only few Bruce Davidson(s) for each era and to get there an enormous competition to by-pass, we might as well stop worrying about where we want to arrive and enjoy the bumpy ride! If the only way to get recognition is to take the “good pictures,” and those are the one, as Bruce said last night “where you are in love with your story” then we should just learn to love more and go shoot what is that we love instead than worrying about who we are in comparison to colossal figures like the Magnum agency photographers like Bruce. Onward with pride, my fellow broke freelance photographers, one step at the time! I hear that! I am learning to be patient with this photog passion but always remembering to relish and have a great time. Great post Fede! How exciting that you’re going to South America soon too. Enjoy yourself. Can’t wait to see your shots. Thanks for this excellent write-up. Ah, I really wish I could have been there. Unfortunately, I had class. I was so tempted to skip! I was at the Burn release party too! It was a pleasure hearing him speak and present some of his work, but as you wrote, it’s never enough. I can’t wait until he has another event in the city sometime.